A great surplus of the fluffy white stuff has been accumulating in the backyard this past week, and there are predictions of more to come. 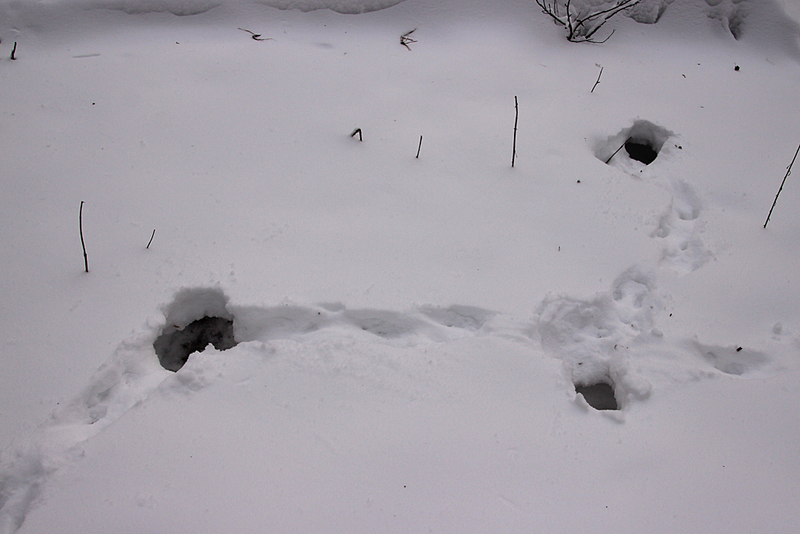 Squirrels have been busy excavating in the snow looking for fallen seed. Every now and then, they seem to take a break and just hang out on a branch. 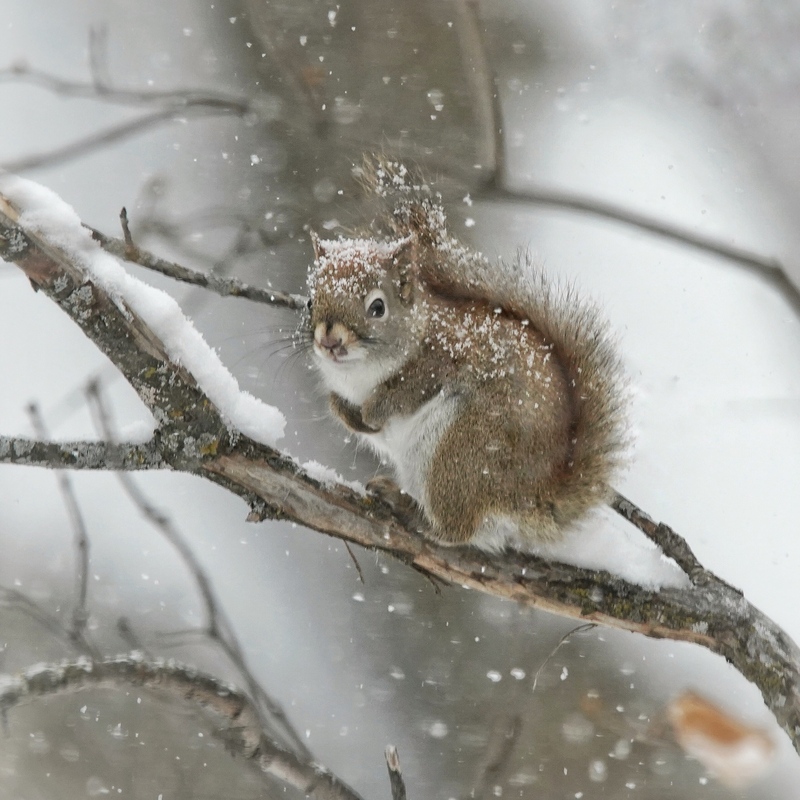 Red squirrels are usually dashing around the backyard, scurrying up branches, hopping from limb to limb. This one stopped for a short rest. 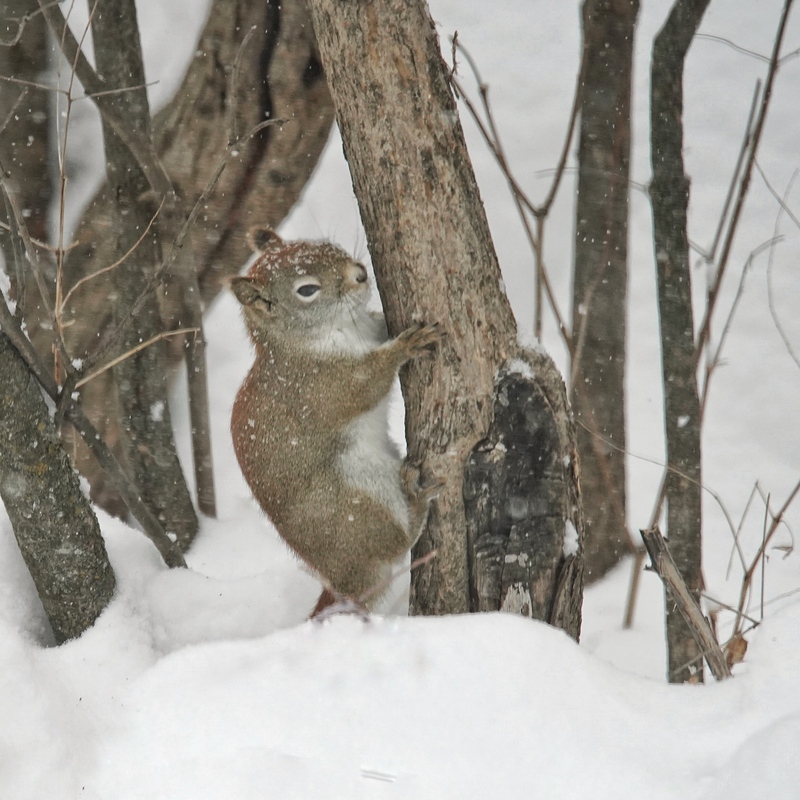 The more typical view of red squirrels, i.e., just before making a mad dash up a branch. I don’t know what this frantic chasing up and down branches is all about, but I did notice that the red squirrels run toward birds in these same branches that have just come back from the feeder with a seed or a peanut. Maybe they are hoping the birds will drop whatever they are eating and fly off, leaving the tidbits for the squirrels to find? A rather thick coating of light snow covered all the old crusty accumulation, erased all the animal tracks in the backyard, and provided a good excuse to spend a lot of the day outdoors. 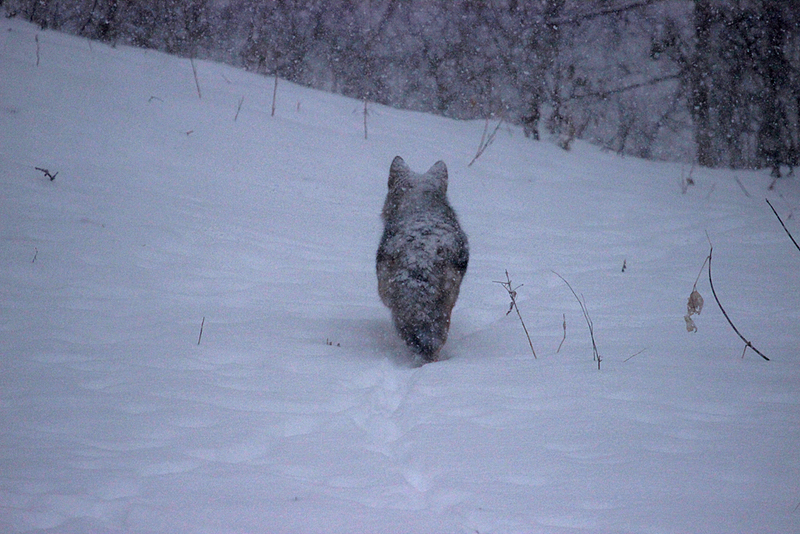 It was still snowing lightly as I made a snowshoe track through the woods, so the light is very flat. I didn’t notice that I had captured a starburst of the sun by accident (top center). By the way, this photo was taken right at noon! In fact, this scene doesn’t look very different when converted to black and white. It was absolutely still, except for the high testosterone chickadees that have started their “phoebe” duets. It seem a little early to think about setting up breeding territories. The only evidence of animal activity was this excavation, probably by a squirrel looking for some buried treasure. 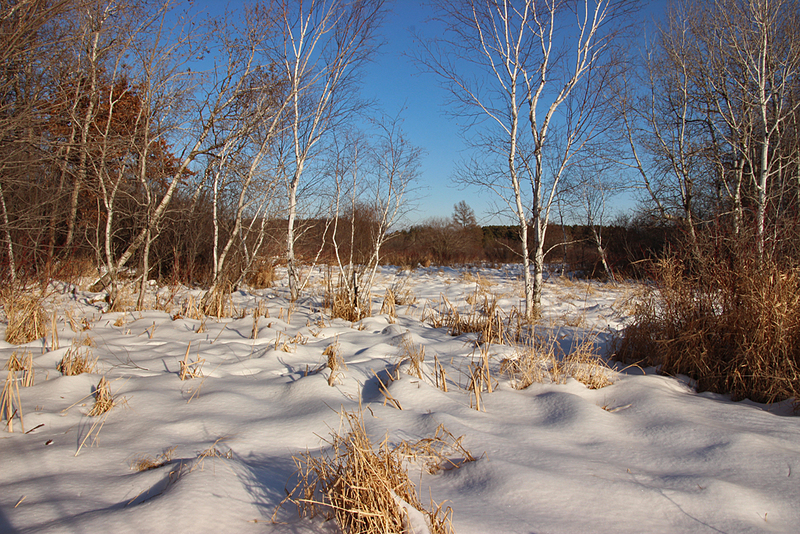 What a difference a little sunshine makes in the beauty of fresh snow. 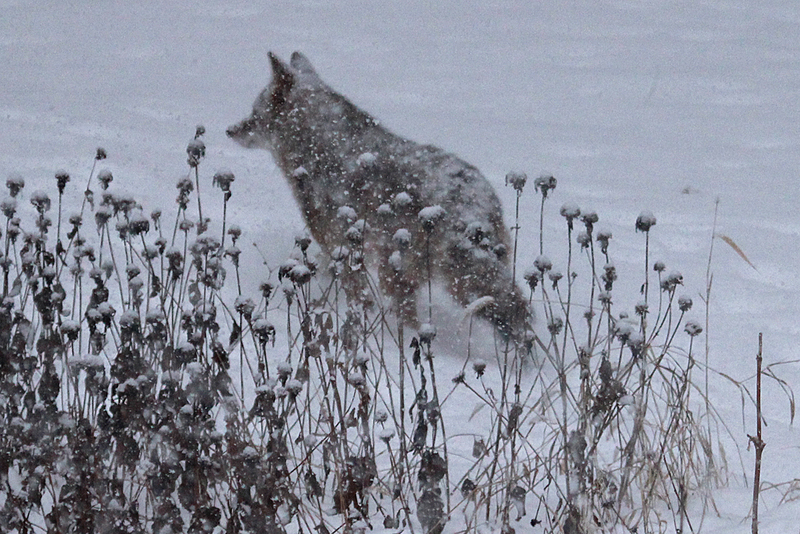 Even a blanket of snow doesn’t hide the outline of a coyote as it stalks its prey. Winter is here. 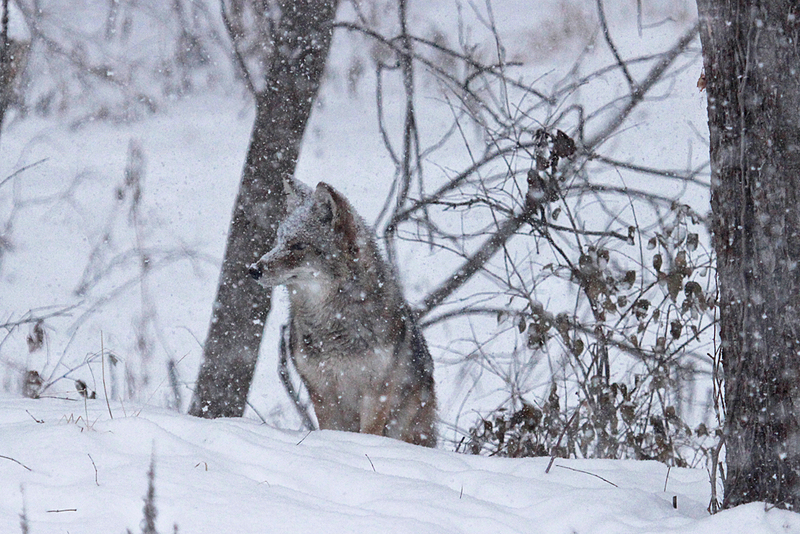 It’s snowing…finally. 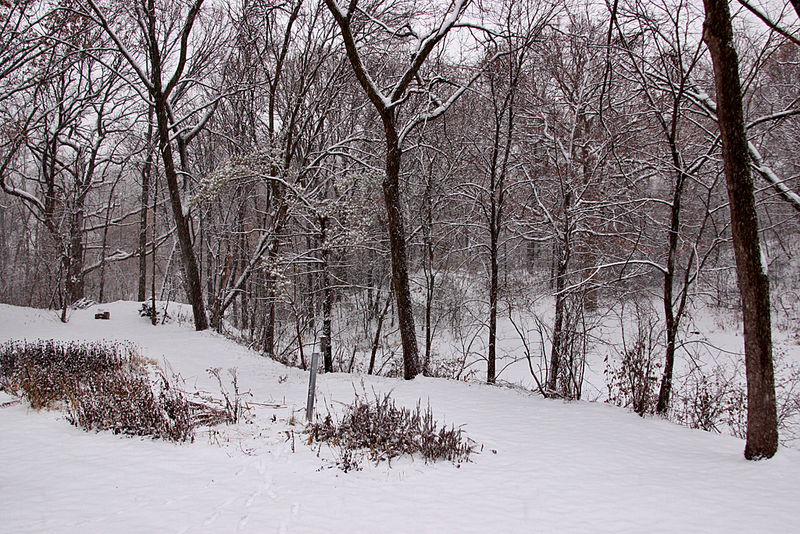 The backyard is silent as a sheet of snow drifts quietly down. Flakes too small to see coat everything. 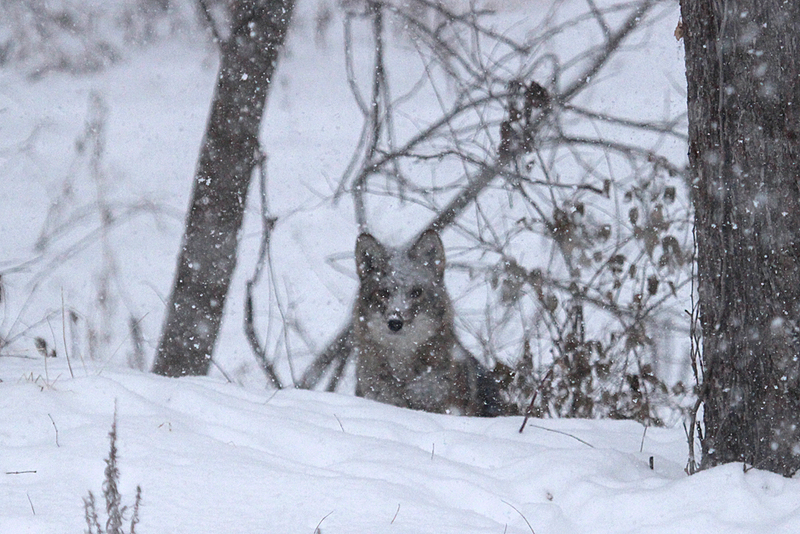 Fill the feeders, the temperatures are about to drop to negative double digits for the next few days. Birds will be hungry. Not much nutrition in a buckthorn berry, but it’s better than nothing. Gently, but rather rapidly, making it hard to photograph anything but a blur. But I thought I would try anyway. It’s interesting that the eye can track what looks like flakes but the camera can’t capture that (or I haven’t learned how, more likely). 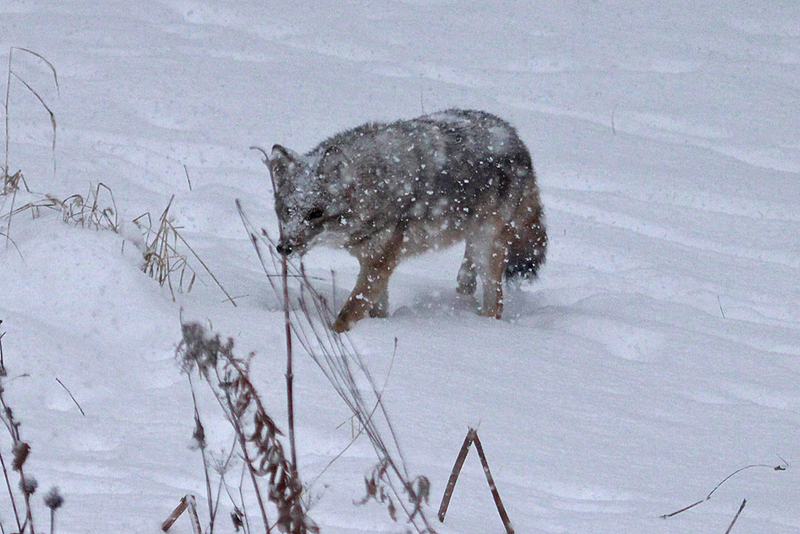 I started out thinking I could stop the action — not possible, even with the highest shutter speed (1/4000). Also complicated by trying to manually focus on snowflakes! Might as well use the blur, and try for an arty look. Tracking the path of the snowflake instead of trying to stop the action produced an interesting effect. Some paths are actually in focus (fine lines). 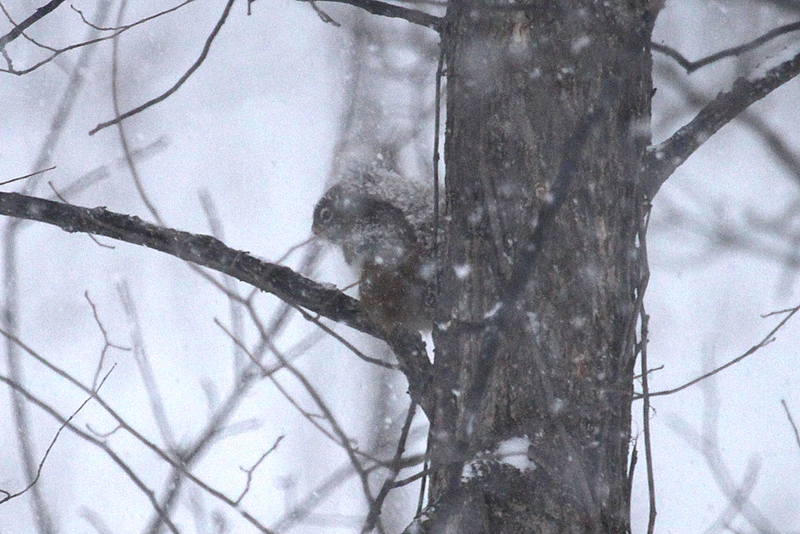 Even the squirrels were put off by this gentle snowfall and deserted the backyard today. And the accumulation was nothing compared to the big snow we had a couple of weeks ago. Grandson and his dad driving their remote control cars in the snowstorm (photo by co-blogger Alison). 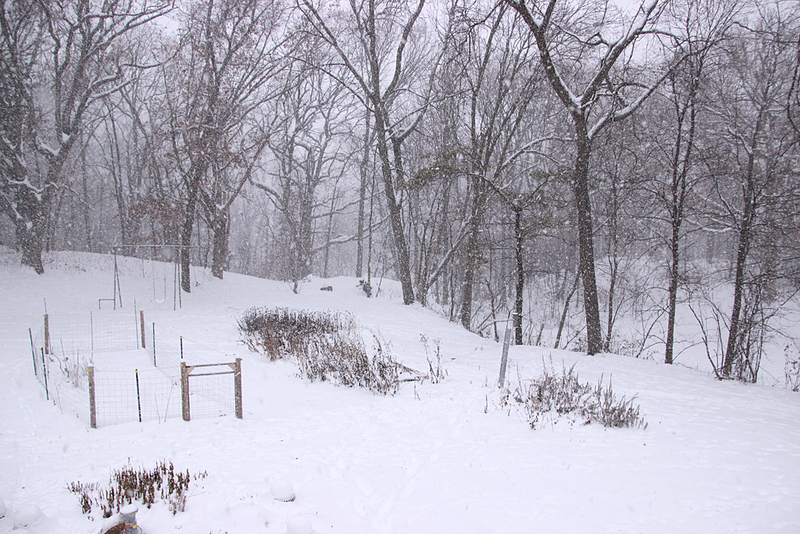 Yesterday, co-blogger Alison said it looked like this at her house in the northwestern suburbs of Minneapolis. 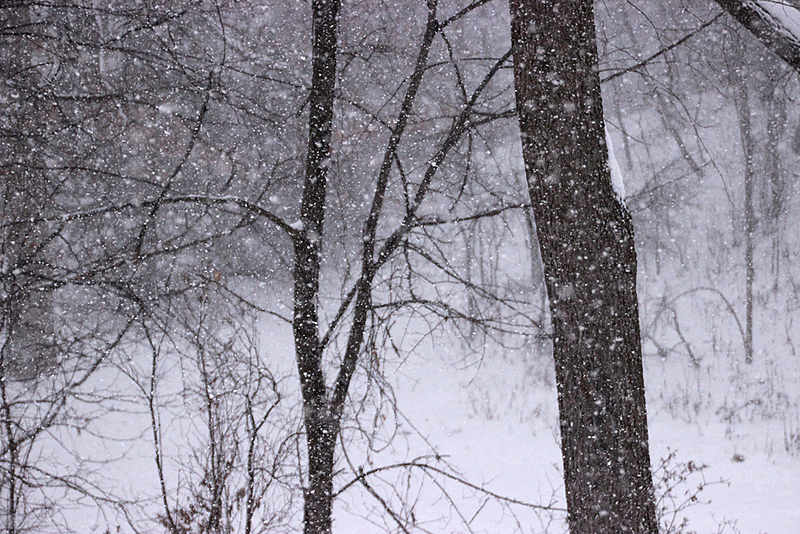 This morning it looks like this in my yard. 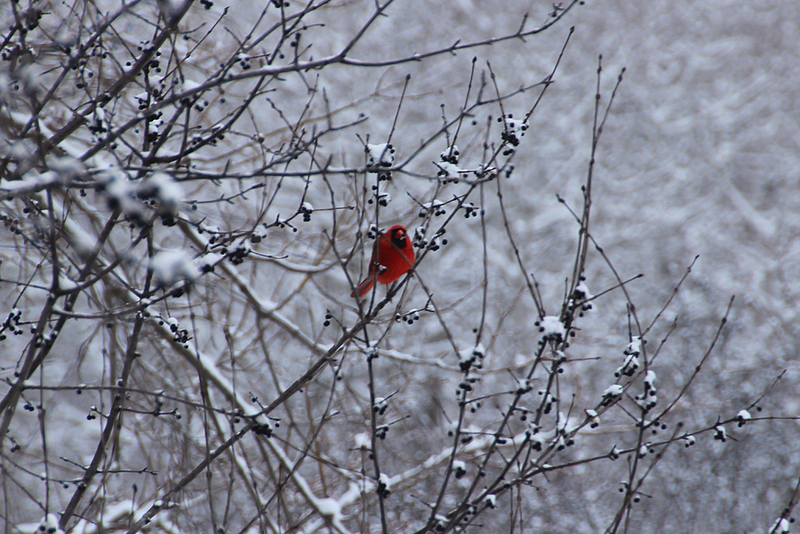 The birds and squirrels have devoured every last crabapple and the trees are plastered with light flakes. 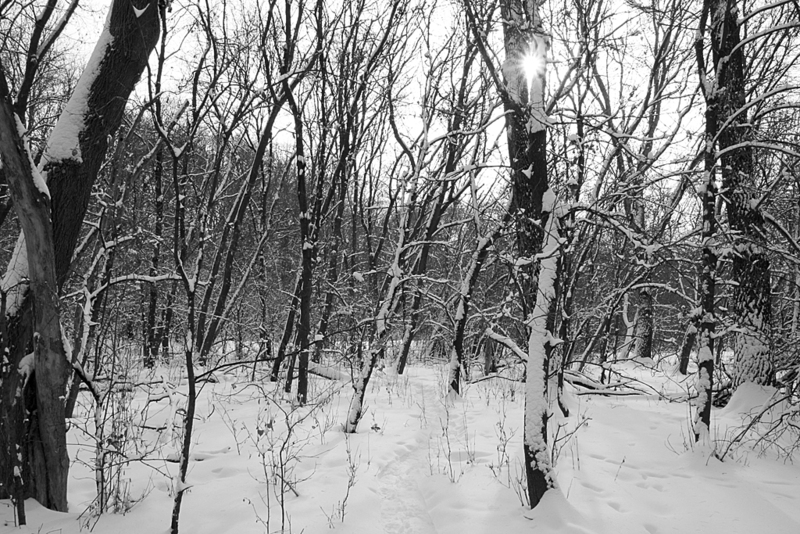 The landscape is silent — no birds, no squirrels, no cars, no walkers, no school buses. It’s a quiet, magical wonderland.